Happy New Year! We are counting down the last days of 2013 and looking forward to a new year with you here at The Scoop! Be sure to stay tuned for something nice for you with our 100th Scoop coming up next week plus a Cozy Home Blog Tour in January and Valentine Blog Tour in February...lots of fun coming your way from The Scoop in 2014! Hi! 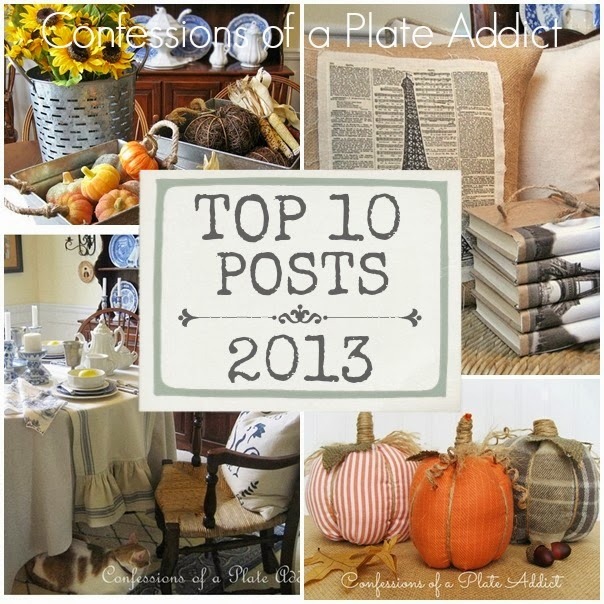 I'm Debbie at Confessions of a Plate Addict and I am excited to be your host this week...and the final host for 2013! Next week will begin a new year with lots more fun and inspiration and our 100th Scoop! Please be sure to come back to visit because we have a treat planned for you! Also, once you have linked up and checked out all of the fabulous inspiration here at the Scoop, be sure to head on over to my blog where I am sharing my readers' favorite posts from this year...with some fun and inexpensive projects for you to try! But now...let's get this party started! I am excited to introduce our guest host...Kirby from Kirb Appeal! If you have never visited her blog, be sure to head on over because you are in for a treat! My name is Kirby and I’m an…oh, wait. Let me start again. I am a wife (of DL, my partner in crime) and two grown (when did that happen?!?) children. I also teach high school English to at-risk students and have a small furniture and home décor business. In terms of blogging, I am pretty much just ridiculous. If you want to read some of my silliness, here’s a post I wrote about decorating for the holidays. It was definitely a treat to look at all the great projects and recipes this week; I managed to check out all the posts (no school this week) and everyone did a wonderful job! I have had fun choosing a few to feature. First, as you may have predicted, Home Is Where the Boat Is had me at candy cane vodka! Next, I fell in love with the buffalo check curtains, awesome backsplash, and holiday touches that Patty has in her kitchen. Just Not the Cakes had a yummy-sounding recipe for something called Banoffee Pie. Yes, please. And I love that Shopgirl gives us directions for a DIY boxwood wreath! Finally, Chateau Chic was just that with touches of red! Thanks so much to the ladies at The Scoop for asking me to participate…it has been fun checking everything out! Thanks for joining us, Kirby! Lovely pic of the two of you. I first want to thank you for hosting this fun party all of 2013 and for having me and also for the features I've been honored to be here. Here wishing you and yours an amazing new year 2014. Thanks again for giving me an opportunity to guest! Thank you for hosting. Love the features Kirby chose, heading over to check out her blog. Happy New Years! What an awesome surprise to be featured! Thank you Kirby and thank you @ the Scoop! means a lot! Great features! Have a Happy New Year Debbie! Kirby picked some good ones, and The Scoop picked a good one to pick good ones!